It’s aesthetically pleasing, but is the design worth the cost? You may not have heard of corten steel, but the chances are high that you’ve seen it. 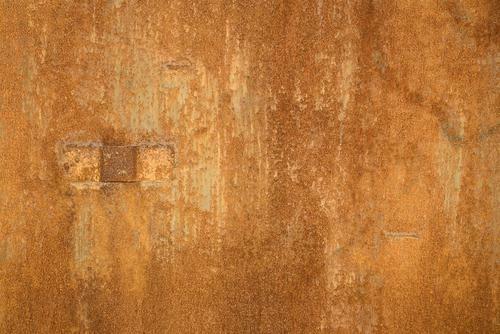 With its characteristic weathered look and rusty orange coloring, corten is easy to spot. Also known as weathering steel and COR-TEN steel, it has been a favored material for sculptures like the England’s Angel of the North and the Chicago Picasso, as well as less glamorous applications like roadside piling. But though the material is distinct, it carries serious environmental and architectural baggage. Here’s why corten steel isn’t all it’s cracked up to be — and here are the alternatives that might grace a future building near you. COR-TEN is a trademark of the United States Steel Corporation. The idea behind this striking material is that a surface layer of rust will form, protecting the steel underneath from further deterioration and eliminating the need for paint. However, the development of this layer requires particular environmental conditions which can’t be guaranteed. When the metal gets wet and the dries out, the rust layer becomes a little thicker, while the underlying solid steel becomes thinner. 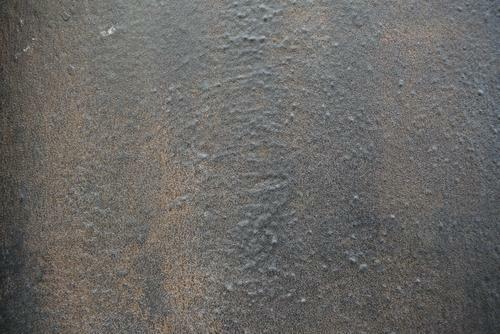 In an ideal world, the rust layer would continue to take hold of the steel for two or three years before stabilizing. The result should be a maintenance-free material with a unique aesthetic. But in the real world, different conditions like too much humidity often mean that the rust layer never reaches a stable point. Eventually, the metal can become perforated and may need to be replaced. In 1964, Eero Saarinen was the first architect to use corten steel in an architectural context. 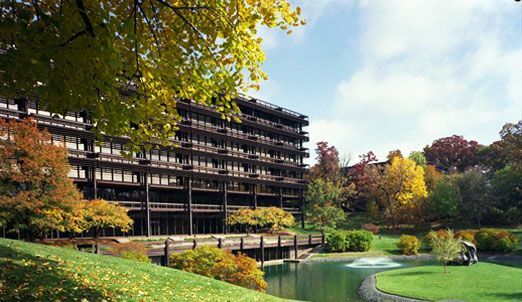 Saarinen was the architect behind the famous John Deere Headquarters in Moline, Illinois. He believed that corten’s weathered look would reflect the down-to-earth nature of John Deere’s business, while the modern building design would reflect the company’s commitment to new technologies. Since the John Deere headquarters opened, architects have returned to using corten steel on a regular basis. James and Mau’s Mint House, built in 2011, is an example of “sustainable, modular architecture,” according to their website. Mint House is a family home encased in weathered steel panels, and opening window screens of the same material depict mint leaves, which give the house its name. The Barclay’s Center in Brooklyn, which opened in 2012, is a well-known example of the use of weathering steel in modern architecture. However, Brooklyn’s residents had mixed opinions when the building was unveiled. The material previously underwent an artificial weathering process designed to equal six years of exposure to the elements. However, despite that treatment, its rusting facade dripped orange-brown stains onto the surrounding sidewalks. There are mixed opinions on whether corten steel should be used in buildings at all. Obviously, architects are still in love with its aesthetic qualities because they continue to use it, but critics are concerned that it doesn’t last long enough to justify its use. Critics are quick to point to the Omni Coliseum in Atlanta, which rusted away and had to be demolished after just 25 years. The New Haven Coliseum suffered a similar fate: it was closed to the public after 30 years and pulled down five years after that. Even US Steel hasn’t recommended corten steel for “architectural application[s], such as roofing and siding” for the past two decades. The reasons given are that abrasion from weather and acid rain cause the oxide skin on the material to reform, which causes the material itself to eventually become perforated. Can we justify using materials that we know may need to be replaced in the near future? Instead, US Steel offers an alternative product for architectural use: COR-TEN AZP. This product has improved solar reflectivity (which is better for roofing), no unsightly staining from water runoff, and a high recycled content and recyclability. While that may sound positive, up to two-thirds of steel production already involves recycling, and large amounts of carbon dioxide are emitted from burning coal and coke as part of the process. This can be hazardous to human health — and it can cause environmental problems. Steel begins life as iron ore, and it is usually obtained through open-cast mining. This method of extracting resources can cause many environmental issues. When rocks are broken open, biodiversity is threatened, erosion and sinkholes occur, and harmful and radioactive substances are released into the environment. Later in the steel production process, sulphur oxides, nitrogen oxides, and carbon monoxide are all released into the atmosphere as a result of smelting. The iron and steel industry is the largest global source of CO2 emissions and the second-largest industrial consumer of energy. A 2012 report shows that that this energy use and its resulting emission of greenhouse gasses could vastly be reduced if the industry instead relied on renewable electricity sources. This is unlikely to happen in the near future, however, because of the high cost of implementing the new technology. There are also environmental concerns about corten steel once it has been incorporated into buildings. A study published in Environmental Pollution found that water runoff from weathering steel may cause problems in the local aquatic environment. The study found that the additional amounts of nickel, iron, and manganese in the area local to a weathering steel building were “not negligible.” The conclusion was that further study is needed to fully assess the risk of this material to the environment. There are alternatives to the use of weathering steel. In Poland, architects Ingarden & Ewy have achieved a similar look to rusted steel with the Pavilion Wyspianski, built in 2000 in Krakow. Here, the rust color is actually a result of special facade bricks which help the building blend with its brick-built Gothic church neighbors. Light filters between the facade’s columns to illuminate the incredible stained glass inside. Innovative architects have looked to history to come up with sustainable ideas for their designs. Traditional building design varies across the globe, according to the locally available materials and the unique environmental challenges the area presents. The resulting buildings are known as vernacular architecture, and they can give modern architects clues which can be combined with modern techniques to make beautiful, sustainable, and characterful buildings. In 2010, architect Arjen Reas used vernacular architecture as inspiration for his truly contemporary family home, “Living on the Edge.” He used thatch to tie the building into both its surroundings and its local history. The thatch was applied to the walls and the roof in a surprisingly modern twist. A thatched roof can last anywhere from 15 to 40 years. Thatch can be produced as an agricultural byproduct, although combine harvesters have made this rare. More often, thatch is harvested from the wild. This low-cost and usually local material offers insulation and weatherproofing in one, and nurturing these plants protects diversity and local species. Traditional materials have given way to mass-produced ones, which are quicker and easier to use and cheaper to produce and maintain. The flip side of this is that traditional skills are lost, and natural environments are damaged in order to gather more materials. Additionally, mass-produced materials lead to less diversity in our architecture. While this may be acceptable to the people who finance our cities, the resulting buildings may be unloved by the people who actually live and work there. It’s easy to love a unique building that typifies one’s home and culture — but it’s hard to love a building that lacks any character. There are clear, environmentally friendly alternatives to corten steel, and those materials can still be used to create buildings that catch the eye and move the soul. What matters most is that we advocate and celebrate architects who work with the planet in mind. "The Omni Coliseum in Atlanta rusted away and had to be demolished after just 25 years."